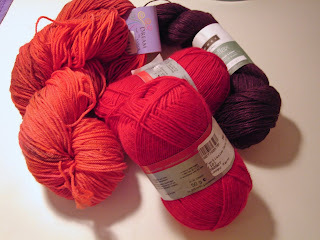 On Thursday, a day I usually blog about knitting, I went yarn shopping instead. On the Ravelry Chicago Knitters forum people are always talking about some stores that I've never been to visit. These four shops are located in neighborhoods that we used to call urban pioneering, although pioneering days are past; most are getting ultra hip and pricey. The vitality of Chicago is not to be exaggerated. Two of these shops are located in a tangle of neighborhoods called Bucktown/Wicker Park/Humboldt Park on the near northwest side. People who live there know the difference, but they kind of blend together for me. "Near" means near the Loop, or central business area of the city. Two are in the south loop (near south side), a more recent development adjacent to the Loop. I live far north. Nina is the most beautiful of these shops. It is set up like an art gallery with a well-curated selection of expensive yarns, although it also stocks basics like Rowan and Cascade. Nina herself, the proprietor, is pleasant and knowledgeable. The location, either Bucktown or Wicker Park, is on an unpretty main street surrounded by renovated working class housing and new townhouses with no parking. Due to the pricey image and tragically hip neighborhood I am not likely to shop there again. I bought a skein of Louet Euroflax sport weight linen to play with. Knitters Workshop is in a homier neighborhood a little to the north and west of Nina. I could park in front of the shop. I recently shopped their moving sale , so I didn't buy anything. Their new location seems a bit cramped. Their yarn collection is less precious than Nina's and more all around. Although they have too much novelty yarn, I would shop here again for sweaters worths of yarn. A few doors down the street is Soutache, an amazing button, ribbon, and trim shop. Knitwerks, the furthest south of these shops, is perhaps my favorite. The friendly owner is a weaver, much to the delight of my weaving friend Linda. This shop is small but larger than Nina with a well-selected collection. Knitwerks carries basics with some more unusual though reasonable brands like Frog Tree, Interlacements, Artworks, and Dream in Color. They have a good selection of lace and sock yarn. I bought a big skein of orange Dream in Color sock yarn since I read online that sock yarn doesn't count as stash. Loopy has a knowledgeable staff, a pretty big selection, lots of basics, and a bustling atmosphere. I was able to park in front, but that might have been just luck. Of all these shops, I think Loopy is the most geared up for long-term success. They have the most interesting classes and feature twice a year yarn tastings which are wildly popular. I bought some inexpensive Fortissima Socka sock yarn in a cardinal red. I need red and orange socks. 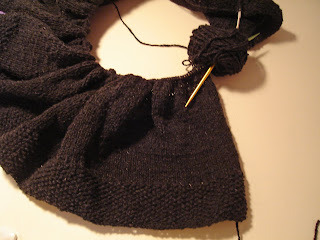 Here is my progress report on the Drama City skirt. It is just over 7 inches long. Kill me now. The ultimate length is meant to be 21 inches. I might switch over to the Kimono shawl soon since the skirt is more wintry and the shawl is more summery and it is getting to be summer (although 40 degrees and raining here today). Four yarn shop visits in a single day -- sounds like heaven! I kept oohing and aahing as I read through your post. Rowan -- oooh; Louet Euroflax sportweight linen -- aaaah; Dream in Color and Fortissima Socka, actually right there in person -- oh boy, oh boy!